AFAM Steel Rear Sprockets - With induction hardened teeth. AFAM Steel Rear Sprockets have induction hardened teeth. AFAM steel rear sprockets are all CNC machined and produced in C45 normalized steel with induction hardened teeth. An harder layer on the teeth reduces wear on sprocket and chain drastically and ensures a longer life span. Executed in silver (zinc plated) or black (electrophoresis) for a long lasting protection against corrosion. The normalized steel prevents the sprocket from micro cracks in the material. This assures the quality of the product to offer you a safe ride. Perfectly round, flat and concentric with the unique AFAM tooth profile make this the best after-market sprocket on the market. AFAM standard steel rear sprockets (- in the reference) are equal to the original color. Executed in either silver (zinc) or black (electrophoresis) to protect against corrosion. AFAM Self-cleaning steel rear Off Road sprocket (SLK+ suffix in the reference). 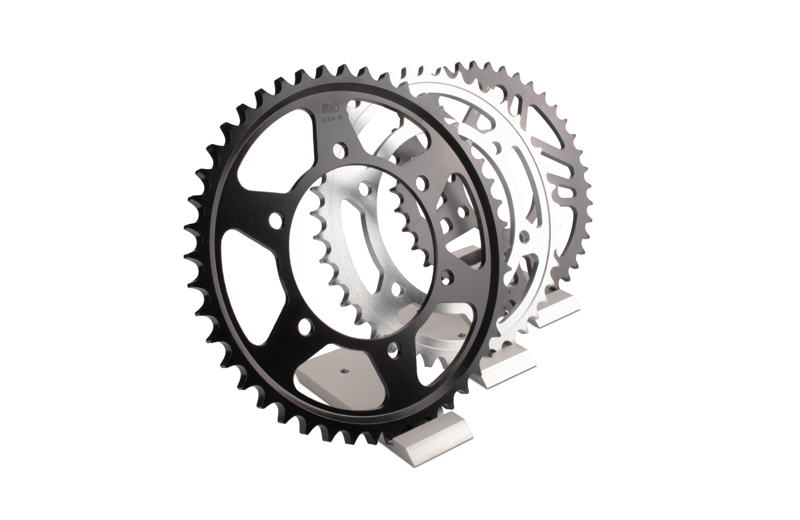 A maximum weight savings (SL Super Light) thanks to its fourth generation T4 design in black color by electrophoresis (K Black) and equiped with mud grooves make this sprocket ideal for extreme conditions, from sand races, the Dakar Rally to MX1. AFAM Steel rear Racing Sprockets (RLK suffix in the reference) are designed to withstand the high performance of today’s Superbikes. Suitable for 520 chain with maximum weight savings thanks to the fourth generation Racing design. We promise you a very high longevity on the race track. Negligible wear from the beginning to the end of the race guarantees you an optimum transmission efficiency.